Olecranon fractures are among the most commonly operated on fractures in the upper limb. There are several fixation methods and here we will discuss tension-band wiring and plate fixation. 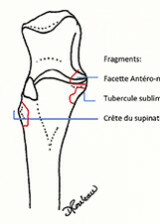 Tension-band wiring is a classic fracture treatment method which is most commonly used in cases of olecranon fractures. The AO theoretical principles2 state that a curved, tubular structure under compression force has a tension side and a compression side.3 Therefore, according to the AO, when tensile force is applied to the tension side, the compression force increases on the opposite side. In keeping with this principle established 40 years ago, a simple fracture with no bone loss or fragmentation must be opposite the tension side. Plate fixation is used specifically in situations where this is not the case.